The HS-3000GC is a user friendly business card slitter that can easily create hundreds of business cards in as little time as possible. With no routine maintenance required, and fast and easy setup this machine pays for itself. The HS-3000GC accurately collects the cards into bins that 1000 cards that are ready to box. 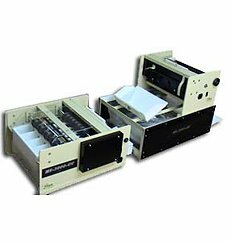 The HS-3000GC business card slitter comes with 8 up or 12 up cassette, a stand and a trim holder. This business card slitter has a ¼” margin on gutter between cards and there are adjustable guides that can save an off register job. This is one machine you have to have if you are routinely producing business cards. If you have any questions or are interested in purchasing the HS-3000GC Business Card Slitter, visit us at SpiralBinding.com. They have great pricing on a full line of Business Card Cutters. Call us at 1-800-631-3572 for more information!